"Very clean, well kept facilities and grounds, and helpful st..."
Have a question for Cabanes des Anges Guest House? "Super friendly staff and spacious rooms." "What a lovely stay, central at gorgeous La dique, close to everything you need and want, like beaches, supermarket, restaurants." "We like our 8 night stay here." Ideal for fun and relaxation, Cabanes des Anges Guest House is located in the La Digue Island area of Seychelles Islands. Situated 15 minutes away from the Inter Island Ferry Terminal and 7 minutes from the beachfront, guests are well located to enjoy the town's attractions and activities. With its convenient location, the hotel offers easy access to the city's must-see destinations. Cabanes des Anges Guest House offers impeccable service and all the essential amenities to invigorate travelers. To name a few of the hotel's facilities, there are Wi-Fi in public areas, bicycle rental, smoking area, safety deposit boxes, tours. 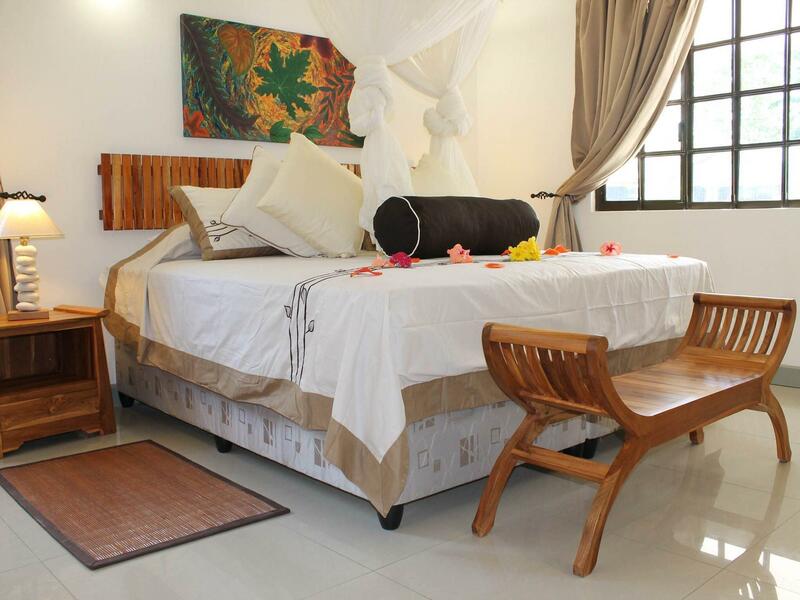 The 9 rooms spread over 1 floor provides a warm and pleasant home away from home. Modern comforts such as mini bar, satellite/cable TV, nonsmoking rooms, television, and a telephone can be found in selected rooms. The hotel offers wonderful recreational facilities such as garden, pool (kids), diving, fishing, and outdoor pool to make guests stay truly unforgettable. 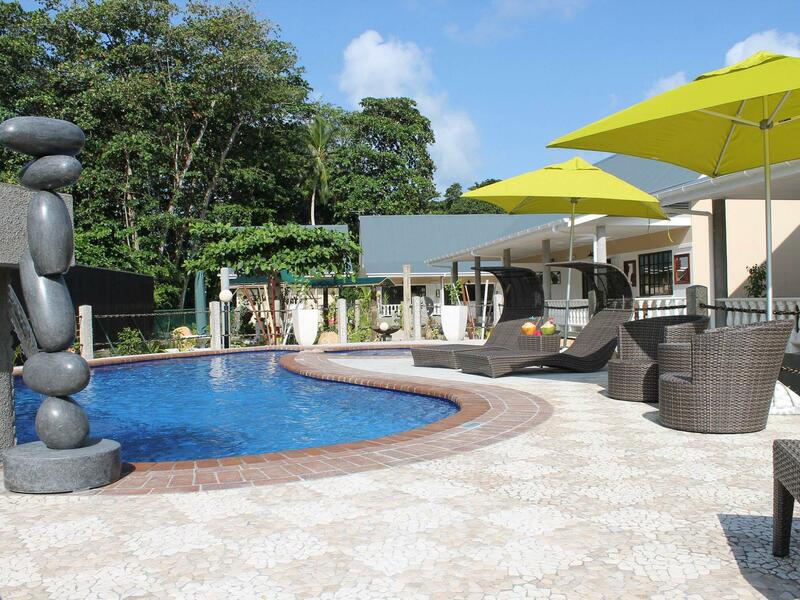 Cabanes des Anges Guest House is your one-stop destination for quality hotel accommodations in Seychelles Islands. "Clean and new premises, beautiful pool, close to harbour, bi..."
The room is clean in general, maybe the flower attract the ants in bathroom which we face in some rooms we stay in Seychelles, a small cockroach from drainage in kitchen. The drainage of washing basin in bathroom not work well and the toilet roll rack is broken, we left it and remove the toilet roll some to use, the housekeeper just put it back like nothing but not ask anyone to fix? every time we use the toilet paper, the rack drops on floor with the paper roll, so frustrated. It would be better to tell we need to wash our used pan and dishes after the first day make-up room without dish washing. Last but not least, 10 Euro for wifi access during the stay. I did read the comment before I went there and seems it is 10 Euro per day on previous time and it is better now maybe?! The good thing is, they have a bicycle for rent based on mutual trust system, claim and pay how many day and bicycle you use during your stay on check-out, appreciate it. Great location, spotlessly clean. V friendly staff. Beautiful gardens. Nice pool - small but v pleasant to sit around after a dip to cool off. Breakfasts were good if a little limited in choice but plenty of it. When you arrive at this place you know you have arrived in Paradise. The gardens are well kept, the pool clean and cool and the optional bikes that were available to hire made our stay easy and relaxed. The cabin was great, a large bedroom and ensuite shower / bathroom and another room with open kitchen living area. We loved our stay - couldn't recommend it more! Ver, very nice Guesthouse and extremely well maintained. Super friendly staff and spacious rooms. Close to the Jetty. This was one of the last stops on our three week trip to the seychelles and it was by far our favourite. Cabanes was very accommodating right from the very start giving us great directions from the jetty (easy 10 minute walk) and the check in process was so flawless we were on the beach that very day! the bike rentals that they offer were fantastic. The room itself is tidy and exactly what you need to be comfortable. Excellent kitchen facilities. Pool was relaxing after a long day out. The location is also not too far from supermarket, takeaways, shops, and dive centre. Highly recommend this place! We have chosen this place on La Digue for our wedding day and honeymoon. It's modern and beautifully designed and very spacious. We love the pool and the well looked after garden. Staff helped us arrange excursion, hire bikes and gave us good tips to get around the island. Special thanks for the after wedding surprise when we came back from the ceremony. Definitely recommended. Fantastic stay at Cabane des Anges. The self catering units are fantastic, kept very clean and very well equipped to be able to make your own meals. The staff is friendly and very helpful for anything you need from booking tours to any other problems you have. The pool is clean and the water is a great temperature. Nice clean rooms, beautiful garden and great pool area. We stayed for 3 nights in september, and had a lovely time. Friendly staff, nice clean room and a good breakfast. The garden was beautiful, and the pool area was great. As there a no sunbeds on the beaches at La Digue, it was great to relax by the pool in the afternoon. Very clean, well kept facilities and grounds, and helpful staff! Wonderful stay, great value! Nothing much to say.. I had a few negative things such as water, ac, and bed sheet I discussed with manager and she said they would look into it. Size of the room ok. Breakfast was acceptable. The location was good close to the jetty. Over all its an acceptable guest house. We like our 8 night stay here. Rented bikes from the vila and then traveled around. The place was great! We enjoyed our stay at Cabanes des Anges Guest House very much. Good room, good bed. Complete breakfast and you stay on the middle of de La Digue Island. perfect place to stay for several days.